Most space games focus on one aspect of travelling the galaxy: either you’re exploring the surfaces of distant moons, building up a base to survive hostile conditions, or shooting alien life forms. 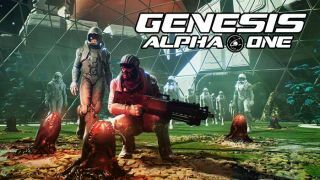 Genesis Alpha One lets you do all three—and so much more. You begin every run in Radiation Blue’s roguelike by designing your ship, which acts as your home base. You’ll need a few essentials to get you started, including a greenhouse to produce oxygen and a tractor beam to pull in debris from space, but the rest is up to you. Rooms and corridors snap together neatly, and it’s easy to lose track of time while you’re perfecting your layout. When you’ve stopped tinkering, you warp directly into your ship to control the Captain, exploring the corridors that you just laid out. Seeing your designs come to life in first-person is a brilliant feeling. Your aim in every Genesis Alpha One playthrough is to find a new home for humanity, but no two routes to that goal are the same. Unlike other space games, you’re responsible for the entirety of the expedition: you set foot on strange, dream-like planets to collect resources, build a refinery on your ship to process those resources into weapons, create storage depots to hoard materials, and expand your base to house an ever-growing crew. Maintaining your base and adding new modules, which you can build on multiple levels, is hypnotic. The base-building tools are easy to use, but your creations can be as complex as you like, with modules and corridors forking off in all directions. You can destroy any modules you’ve previously built if it starts to interfere with your grand design, too. You’ll also have to personally maintain malfunctioning machines, assign the duties of your crew to ensure work gets done quickly, and oversee the cloning of new crew members, either from human DNA or from other species you encounter on your travels. You’ll find yourself sinking into a routine when you’re onboard. You’ll work out your favourite route for patrolling the corridors, and the best formula for ensuring resources are moving efficiently. But that doesn’t mean Genesis Alpha One is a game light on action—far from it. You’ll fight enemies when you touch down on planets to grab resources, ranging from humans armed with shotguns to crawling insect aliens that want to eat your face. You’ll fight them in tense FPS sections, often in low visibility environments, the dust rising from the surface of strange, alien planets. Enemies will try to board your ship, too. Some might sneak in when you use your tractor beam to pull debris from outer space, or a pirate crew might try and raid you for valuable loot. These dangers mean you should place turrets in your vessel to protect your crew members—if they die, it’s game over. It almost feels like a mini tower defence game in which you’re placing your defences in strategic locations. When you finally exhaust the possibilities in the tiny corner of space you’re currently visiting, you have the whole rest of the galaxy to explore, and you warp between systems in seconds. It’s a procedurally-generated world of near-infinite possibility, and you never know what the next sector of space will hide, and what enemies you’ll have to face. It’s the variety—that blend of shooting, base-building, resource management and exploration—that makes Genesis Alpha One feel utterly unique. Genesis Alpha One is available now, exclusively on the Epic Games Store.